The Independent State of Samoa, commonly known simply as Samoa, is a small country in Polynesia that occupies the western half of the Samoan Islands (the rest of the archipelago is the territory of American Samoa, a United States unincorporated territory). The islands were discovered and inhabited by the Lapita people around 3.5 millennia ago. The first Europeans arrived in Samoa in the early 18th century. They included the Dutch explorer Jacob Roggeveen and the French explorer Louis Antoine de Bougainville. Contacts with Europeans intensified after the arrival of British missionaries in the 19th century, who established the Congregational Christian Church of Samoa. The United States, Great Britain and Germany sought to take control over the Samoan Islands. During the Samoan Civil War fought in the late 19th century, each of the three foreign powers aided the rival Samoan factions to win their trust and support. During the war, the UK, Germany and the United States had a standoff known as the Samoan Crisis. It eventually resulted in the partition of the archipelago into German Samoa and American Samoa, as stated in the Tripartite Convention of 1899. During the First World War, German Samoa was seized and occupied by New Zealand. After the war, Germany relinquished its claim to Western Samoa under the Treaty of Versailles. The islands were administered by New Zealand as a League of Nations Mandate. When the League of Nations ceased to exist, Western Samoa became a UN trust territory. 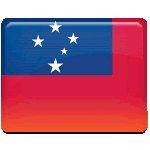 Samoans began to strive for independence from colonial rule in the early 20th century. The non-violent Mau movement was especially active in the late 1920s and early 1930s, but its efforts to achieve independence succeeded only in the 1960s. New Zealand agreed to grant Samoa independence in November 1961. The Trusteeship Agreement terminated on January 1, 1962, making Samoa the first South Pacific island country to gain independence. Although the independence of Samoa was declared on January 1, Samoan Independence Day is celebrated on June 1. It is a significant public holiday observed throughout the country with a flag hoisting ceremony, an independence anniversary speech delivered by the head of state, a gun salute, church services, parades, an award ceremony, and traditional entertainment including song and dance. One of the main highlights of the Independence Day week celebrations is fautasi races. A fautasi is a traditional Samoan boat made from a hollowed-out tree which is about 100 feet long and can accommodate a rowing crew of 50. The top three finalists in the Independence Day race receive a cash prize sponsored by the government. Although the sport used to be male-only, all-women crews have participated since 2013. Alongside Samoan entrants, crews from Hawaii, Tonga and American Samoa have participated.